Straight off the menu at Vancouver’s The Flying Pig, the slow cooked meal manages to be both comforting and impressive at once. Some recipes look so cozy and comforting that it’s hard to imagine eating them in anything other than pajamas. Others instantly strike us as impressive enough to satisfy the most esteemed of dinner guests. This dish — which is straight off the menu at Vancouver’s The Flying Pig and comes to us from the cookbook Vancouver Eats: Signature Recipes from the City’s Best Restaurants — manages to be both at once, and then some. 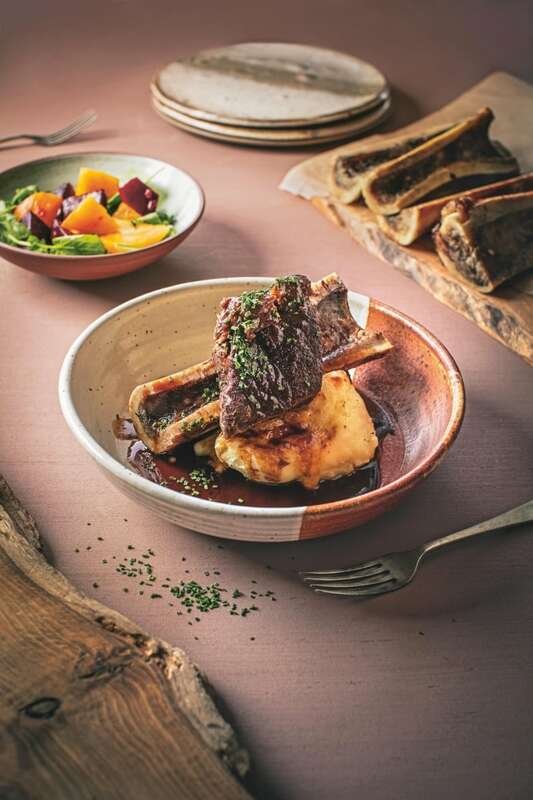 The short ribs are slow-cooked in red wine until melt-in-your-mouth juicy, then placed on a bed of buttery mashed potatoes and paired with roasted bone marrow (a process made simple thanks to the step-by-step instructions provided). With plating tips so you can get the presentation perfect, make it for your next date night or dinner party — dress code up to you. Preheat oven to 275°F. Divide short ribs (or chuck flat) into 8-ounce portions and season with salt and pepper. Heat oil in a large Dutch oven over medium-high heat. Working in 2 batches, brown short ribs on all sides, about 8 minutes per batch. Transfer short ribs to a plate. Pour out all but 3 tablespoons of drippings from pan and add red wine, stirring up any browned bits and cooking until reduced by a third. Add onions, carrots, celery and tomato paste, stirring constantly until combined. Add short ribs and any accumulated juices, thyme, rosemary and bay leaves. Pour in stock, ensuring ribs are completely covered with liquid. Bring to a boil, then cover Dutch oven with lid and transfer to oven. Cook for 8 hours. Transfer short ribs to a platter. Strain sauce through a sieve to remove solids and discard. Pour sauce into a heavy-bottomed saucepan. Spoon fat from surface of sauce and discard. Reduce sauce until slightly thickened, then season with salt and pepper. Place potatoes in a large saucepan and add enough water to cover and the 1 tablespoon salt. Bring to a simmer and cook for 15-20 minutes, until tender. Drain. Do not wash the saucepan. In a small saucepan, heat butter and milk over low heat until butter is melted and liquid is simmering. Using a potato ricer or masher, press potatoes back into large saucepan. Stir in butter and milk, then season with salt and pepper. Preheat oven to 325°F. Drizzle oil over cut sides of marrow bones and season with salt and pepper. Place in a roasting pan and roast cut-side up for 15-20 minutes. Preheat oven to 350°F. Spoon mashed potatoes into one side of 6 (15-oz) oval casserole dishes. Sprinkle cheddar overtop, then place cooked bone marrow in the dish, leaving room for short ribs. Bake for 10 minutes, until cheese has melted. Place a portion of short ribs in the casserole dish and spoon sauce over meat. (Alternatively, scoop the mashed potatoes onto a plate, angle one marrow bone and one piece of braised beef over the potatoes and spoon sauce on top.) Garnish with chopped chives. Excerpted from Vancouver Eats: Signature Recipes from the City’s Best Restaurants by Joanne Sasvari. Copyright © 2018 Joanne Sasvari. Recipes copyright © 2018 by individual restaurants. Published by Figure 1 Publishing Inc. Reproduced by arrangement with the Publisher. All rights reserved.